Leonard Baskin established the Gehenna imprint in 1942, while he was a student at the Yale School of Art. 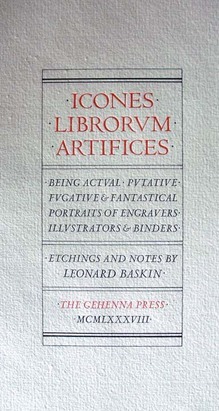 Some people name Icones Librorum Artifices as one of the Gehenna masterpieces. The volume offers thirty-two portraits drawn by Baskin and printed by D. R. Wakefield, along with biographical text written by Baskin and imaginatively set in Arrighi and Centaur type. The subjects of the portraits are both real and imagined, well known and unheard of, including men and women from the last five centuries. 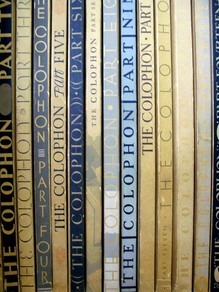 The Colophon. An adventure in enthusiasm. 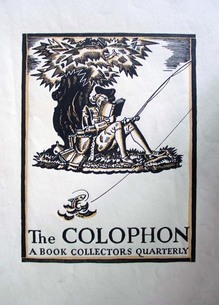 “An adventure in enthusiasm.” This is how Elmer Adler (1884-1962) described his magazine The Colophon: A Book Collectors’ Quarterly (later A Quarterly for Book Lovers). 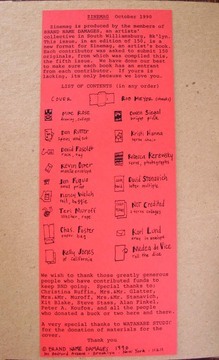 Each signature within an issue was produced by a different printer using their own choice of papers, typography, and illustration. 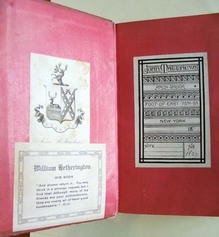 The signatures were bound together in boards by Adler’s Pynson Printers and marketed to 2,000 subscribers. 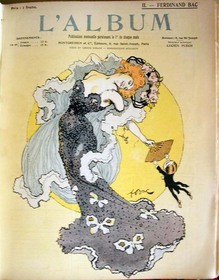 Similarly, each cover was designed by a different artist in a different style beginning with the first issue, which was designed by the Scottish American artist Edward Arthur Wilson (1886-1970), a student of Howard Pyle. 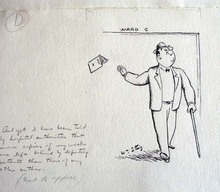 Adler kept the original art, including separations and multiple drafts for each issue. 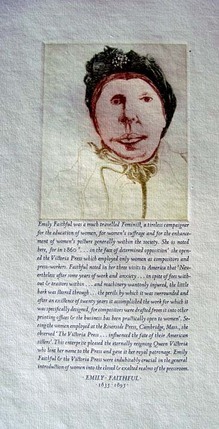 When he moved to Princeton to establish the graphic arts collection for the university, the cover art came with him. Why Does Nobody Collect Me? 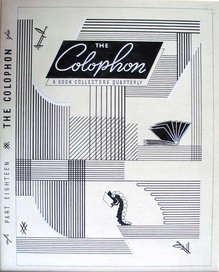 In 1934, the American humorist Robert Benchley (1889-1945) was cornered by Elmer Adler (1884-1962) to write a piece for Adler’s magazine The Colophon. This was one of twenty essays Adler commissioned by successful authors telling how they first got published. 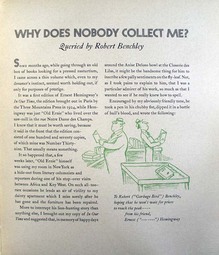 Benchley titled his “Why Does Nobody Collect Me?” and had his friend from the New Yorker, William Steig (1907-2003), illustrate it. In 1937, Adler brought all the essays together in Breaking into print: being a compilation of papers wherein each of a select group of authors tells of the difficulties of authorship & how such trials are met (GA 2009-0083N). For the book, he added the answers to a series of questions about how each author wrote, how many drafts they made, and so on. 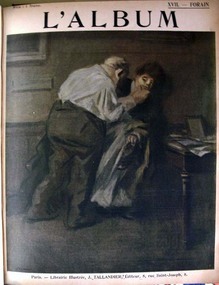 Happily, Adler saved the original art, which now resides in the graphic arts collection. 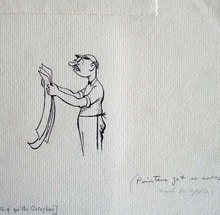 William Steig (1907-2003), Untitled pen drawings for Robert Benchley’s “Why Does Nobody Collect Me?” in The Colophon, Part 18, 1934. 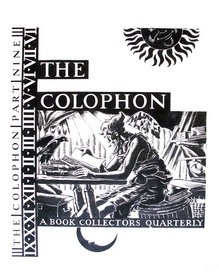 Graphic Arts GC051 The Colophon Collection. In 1897, the Aldershot Cottage Hospital (approximately thirty-five miles from London) finally opened with beds for ten patients. Every fall, the town of Aldershot had been holding a carnival or park fête to raise money in order to build a hospital. 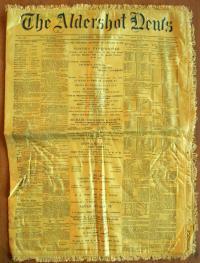 Special cloth programs and issues of the Aldershot newspaper were printed on colorful silk/satin and sold as souvenirs. 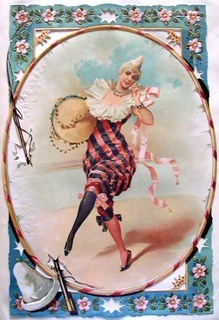 Several of these from the first and second carnivals have been acquired by graphic arts. Note the advertisement on the front page for a typewriter offering visible writing. 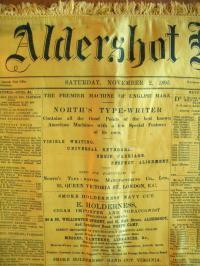 The Aldershot News. No. 72, Saturday, November 2, 1895 (Aldershot: printed and published by the Proprietors, Gale and Polden, Ltd., Wellington Works, 1895). Printed on yellow silk. Graphic Arts (GAX) 2010- in process. The First Aldershot Cyclists and Tradesmen’s Carnival in Aid of the Proposed Cottage Hospital for Aldershot … November 5th, 1894. 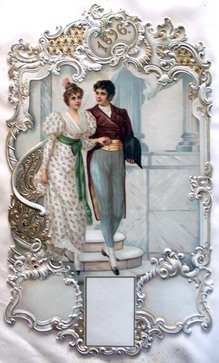 Official programme. 10 leaves printed on pink silk. Graphic Arts (GAX) 2010- in process. Official Programme of the Second Annual Hospital Carnival … Wednesday, October 30, 1895. (Aldershot: J. 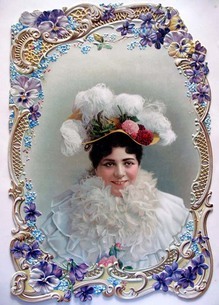 May, Steam Printer, 1895). 10 leaves printed on yellow silk. Graphic Arts (GAX) 2010- in process. Georges Perec (1936-1982). La Vita, Istruzioni per l’Uso (Life: A User’s Manual). Milano: Rizzoli, 2009. Graphic Arts (GAX) 2010- in process. The book chosen here is Georges Perec’s La Vita, Istruzioni per l’Uso (Life: a User’s Manual), which has been transformed by the Italian designer Enzo Mari (born 1932) into a jigsaw puzzle in a Plexiglas frame. 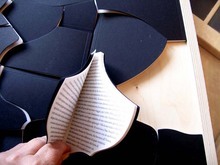 The puzzle’s eighteen pieces are each small books with one chapter of Perec’s text, translated into Italian. 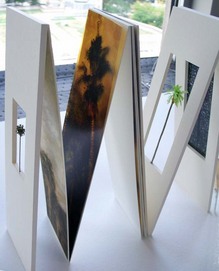 The work is delivered along with a short volume explaining the project and a copy of the original book. 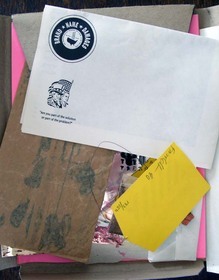 My thanks to Linda Turzynski who processed this acquisition for us. 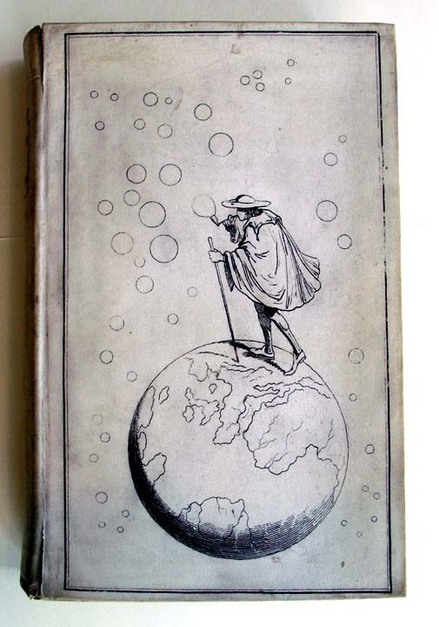 Princeton has acquired a first edition of Head’s Bubbles with the unusual cover design of a hiker walking across the globe while blowing bubbles stamped, front and back, not on cloth but on vellum. The paneidolon seems to have been a compromise between a camera obscura and a camera lucida, involving a box big enough for the artist’s head and arm, in which one could trace a transmitted image. 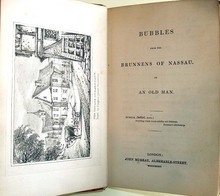 Sir Francis Bond Head (1793-1875), Bubbles from the Brunnens of Nassau. 1st ed. (London: J. Murray, 1834). Graphic Arts GAX 2010- in process. 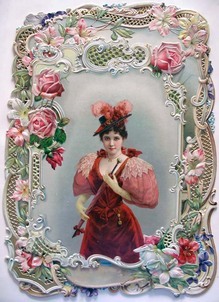 Victorian Color Printing Album. [London, 1890s]. Graphic Arts (GAX) 2010- in process. This lovely album of fancy color printing may be a sample book of M. L. Jonas Wolf & co, Ltd, of 21 Australian Avenue, London. 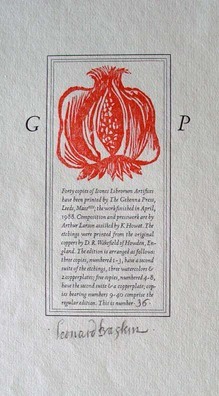 The volume offers examples of printing on forty-five unnumbered leaves, with approximately 135 samples (both mounted and unmounted), most of them numbered in pencil on the blank leaf above the sample. A few are dated: 1896 and 1897. Some have M.L. Jonas Wolf’s stamp on the back. 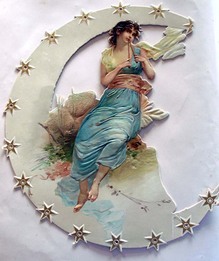 Judging by the nature of the images here, it seems that the company produced standard, pleasing images designed to be used for decorative purposes such as greetings cards, calendars, menus, advertisements and other mass-produced printed products. The pictures are largely designed to appeal to the dreams of the aspirant middle class: cherubic children and kittens, shepherdesses, lords and ladies in historical dress, soldiers and sailors, and colorful animals. The mounted images, which vary from about 200 x 150mm to 450 x 300mm in size, are all numbered in the same hand in pencil, and it is probable that the volume was part reference and part sample book. Annotations read, for instance, “21047 grained block” or “21182 varnished block” or “21061 gelatined, incrusted, block” (the last named being partly raised and gilt, and available as an alternative 21060 without incrustation). Some of the blocks include movables or flaps. One image of a sailor has him climbing up (or down) a real rope. 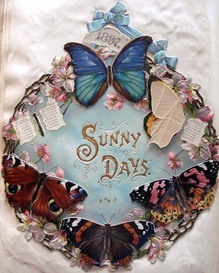 A calendar, pictured above, entitled Sunny Days, has the months concealed by the wings of six butterflies, whose wings can be folded back to check a date. 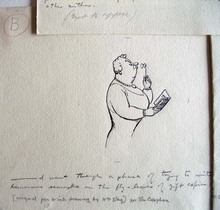 George Woodward was a caricaturist from Stanton-by-Dale, Derbyshire, whose drinking habits are perhaps better known than his art. When he moved to London his inheritance had already been spent. 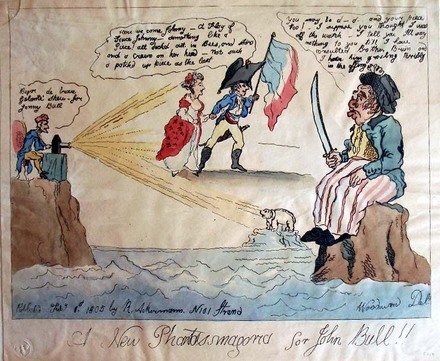 More often than not, he provided the drawing of an idea to publishers and to other caricaturists, rather than a completed etching. He very sadly passed away one night at his usual spot in his local tavern. In 1916, the Chilean poet Vicente Huidobro (1893-1948) founded a new artistic movement, which he called Creationism. He wrote that a poet shouldn’t just “sing to the rose but make it flower in the poem itself” (Por qué cantáis la rosa, hacedla florecer). 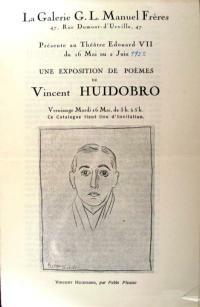 Huidobro left Chile and settled in Paris, where he mixed with the Parisian avant-garde, including Pablo Picasso, Juan Gris, Jacques Lipchitz, Joan Miró, and Paul Eluard. In 1921, Huidobro founded the first of several arts journals, this one called Creación (self-published using a family inheritance). Early in 1922, an exhibition entitled Salle XI opened at Théatre Eduard VII. On the walls were thirteen visual poems by Huidobro, who referred to them as paintings. 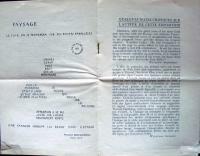 The exhibition invitation/catalogue (seen here) contains a preface by Maurice Raynal, a portrait of Huidobro by Picasso, and one of Huidobro’s letterpress calligrams titled Paysage (Landscape), dedicated to Picasso. 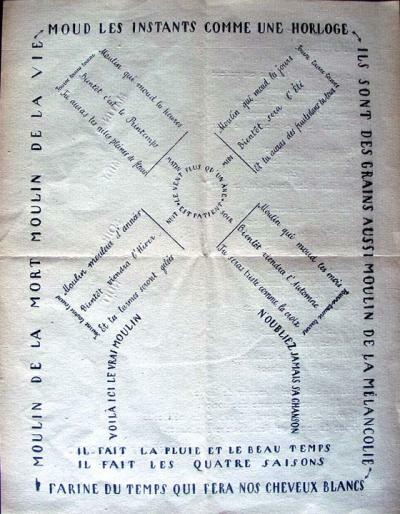 Folded and laid in was the poster/poem/manifesto Moulin, (first published in Creación) whose lines form the image of a windmill, designed by Robert Delaunay. 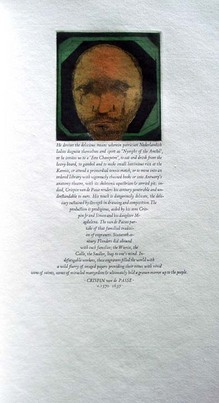 The text of the poem begins at the center, moves outward with verses on each turning blade, and ends with the line at the bottom of the page concerning grey hair. 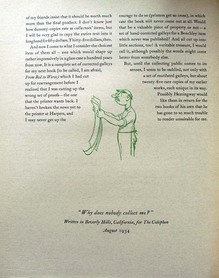 Not long after this, Huidobro abandoned the idea of writing calligrams such as Paysage and Moulin, and began concentrating on the verbal sequence rather than the visual display of words. The hinged pages and monotype images can be read horizontally and/or vertically, in daylight or using the tiny flashlight that comes attached to the box. When one shines the flashlight on the tree and through the opening at the back of the book, the light projects mysterious shadows of trees against the the luminous night sky. Charles Hobson, Trees. Poem by W.S. Merwin (San Francisco: Pacific Editions, 2010). Copy 8 of 30. Graphic Arts (GAX) 2010- in process. 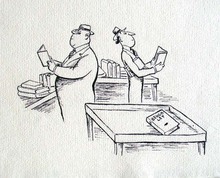 For more information, see http://www.charleshobson.com/books/trees.html. 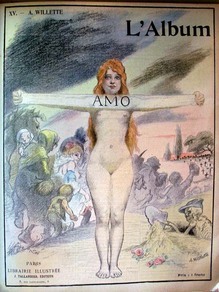 At the turn of the last century, the development of color lithography led to the emergence of many French periodicals. Gil Blas illustré, Le Rire, L’Assiette au Beurre and Le Figaro are some of the best. 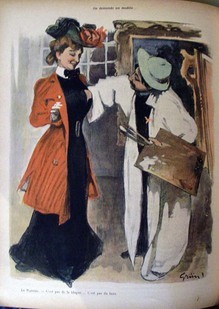 My favorite, L’Assiette was loosely based on the German magazine Simplicissimus and devoted each issue to a single topic. 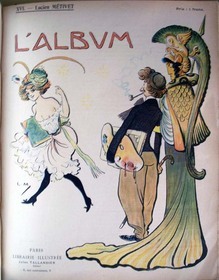 The French publishing house of Jules Taillandier decided to get into the game and issued the short-lived periodical titled simply: L’Album. 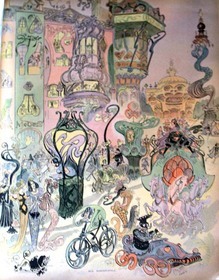 Each issue was devoted to the work of an individual artist, with a centerfold section offering several double-page spreads and commentary by Lucien Puech. The imagery was uncommonly graphic and sexual in nature, possibly the reason it did not last very long. 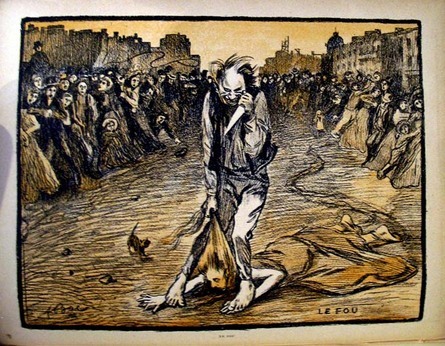 The work of painters Adolphe-Léon Willette (1857- 1926) and Jean-Louis Forain (1852-1931) was featured, along with Emmanuel Barcet, Marcel Capy, Jacques Villon, and many other. Thank goodness New York Times art critic Roberta Smith included this comment in her survey of small, new Brooklyn galleries, published March 23 1990. 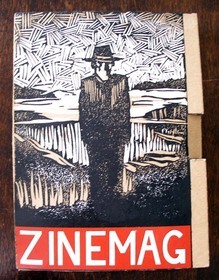 Without it, we would never know what we had found when this uncatalogued issue of the periodical/artists’ book Zinemag turned up. No other copies are listed on OCLC or in Arcade, the catalog for members of the New York Art Resources Consortium (NYARC). We would certainly be interested in completing the run, if anyone kept their issues. 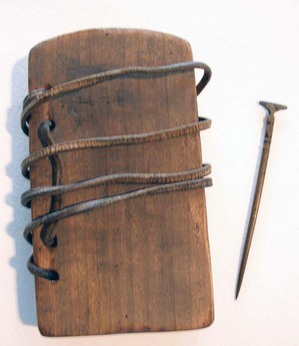 Wax coated tablets (either singularly or in bound diptyches) provided an inexpensive, portable, and reusable writing surface. Today, we say “start with a clean slate,” after the clerics who would clear the wax surface of their tablets using the flat top of the writing stylus. 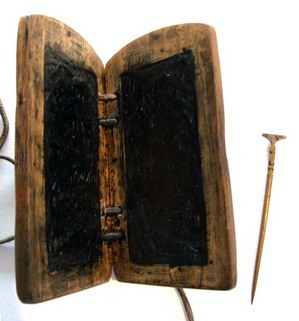 The wood diptych and bronze stylus in graphic arts measures 9.5 x 17 x 9.5 x 2 cm with four holes in each tablet bound together with a leather strap. It is assumed that our first curator, Elmer Adler, had this made for teaching. 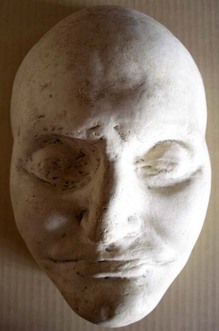 Aaron Burr Death Mask, 1836. (CO770) Gift of Laurence Hutton. 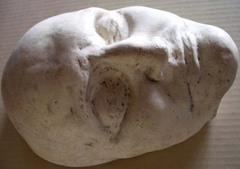 Author, essayist, and critic, Laurence Hutton (1843-1904) was a collector of death masks, which he donated to Princeton University. Although he had many stories about the collection, he was only completely sure of the provenance and authenticity of a handful. 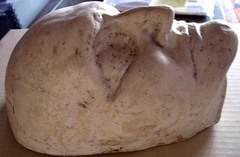 One of these was the mask of Aaron Burr, Class of 1772 (1756-1836).